Most of the wapmasters in Xtgem wapsite builder where build both PC version and Mobile version to get higher ranking in Search Engines and for getting more traffic . But some other wapmasters where create PC Version using Website Builders and its mobile version using Xtgem . On this case the Web version need to insert a code from Xtgem to redirect when people browsing the Webversion site using mobiles to redirect to the Xtgem wapsite . Through this article you will learn about the Xtgem redirect code which helps you to redirect the mobile users from web version . It is very easy to redirect users from web version to mobile version of Xtgem site using a simple redirecting code when people browsing web version using smartphone or mobile phone . Xtgem already developed a Java-script which will help you to do this . It is very easy to get the Redirecting code from Xtgem wapsite builder . For each wapsite you created in Xtgem have their own Xtgem Mobile Redirecting Code . 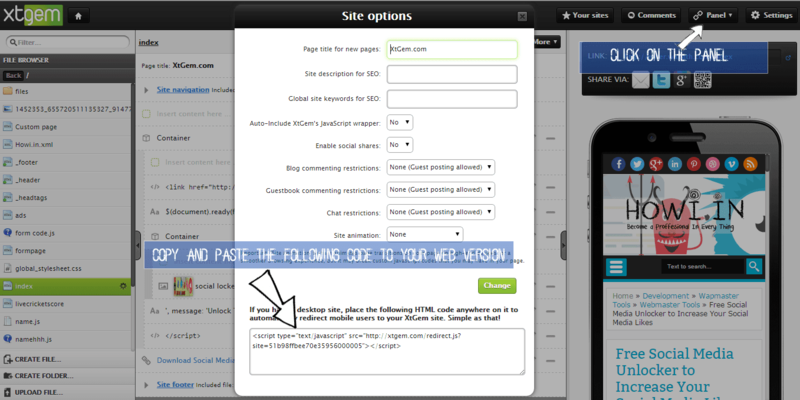 To get your Xtgem wapsite builder mobile redirecting code , Follow the steps given below . Enter to the Xtgem wapsite which you want to get the Redirect Code . Click on the "Panel" on the "Right Header" of the Xtgem Building Tool . By redirecting your visitors from web version to the mobile version , It will help your mobile users to access your content easier than Web version . Create Fully Automated Wapsite Using Xtgem Auto-index Script . Active Xtgem 5MP Upload Plan in Your Xtgem Wapsite . How to Earn Money From Your Xtgem Wapsite . Add Your Xtgem Wapsite to Google Search Engine .